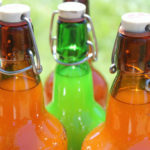 Fermented honey is the basis of the delicious beverage mead, and can be featured in other ferments such as kombucha, but did you know that you can also ferment honey with alliums and herbs to make a tangy, robust, immune-boosting remedy? 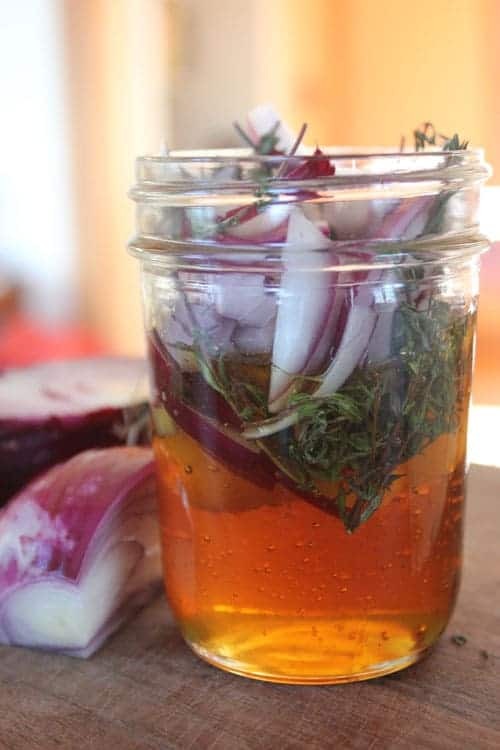 Today I’m going to share with you a recipe for fermented honey with red onions and thyme, adapted, with permission, from Colleen Codekas’s new book, Healing Herbal Infusions. 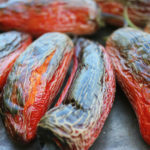 I think you’ll find this ferment to be so simple and tasty that it will become a staple in your home, especially leading up to cold and flu season. Onions are high in antioxidants and Vitamin C, and fresh herbs such as thyme are also known to support immunity. 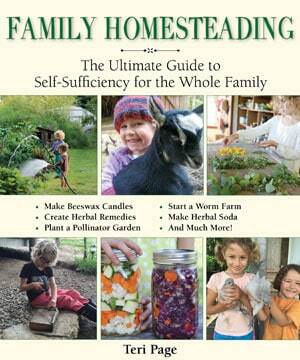 So head out to your herb garden, harvest a few sprigs and let’s get fermenting! Raw honey is a natural product that is shelf-stable, meaning you can extract honey from a beehive, place it in a clean container on the counter, and it will keep for a very, very long time. However, according to Cultures for Health, when raw honey’s moisture content rises above 19%, it will begin to ferment. 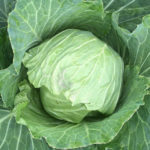 The appropriate level of moisture can be obtained by adding water, or, in the case of this ferment, by adding moisture-rich vegetables and fresh herbs. The fermentation process makes the honey a bit bubbly and more runny, which, if you think about it, is the perfect consistency for a daily spoonful of immune system-supporting fermented honey with red onion and thyme! 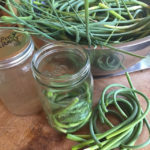 This really is one of the most simple fermented recipes out there, as you’ll only need three ingredients: Raw honey, red onions, and fresh thyme. However, if you lack those ingredients, don’t despair! This is also a very flexible recipe, one that allows you to use a variety of fresh herbs and vegetables. One note about using raw honey: As you can see in the photo above, my raw honey has crystallized, which causes it to become more solid. There is nothing wrong with this honey, but you will have a hard time coating your red onion and thyme with crystallized honey. To liquify the honey, simply heat a pan of warm water to no higher than 105 degrees F and submerge your glass jar of honey until it has liquified. This process may take a few hours, depending on how large your jar is. Each day, tighten the lid and invert the jar a few times to make sure everything remains coated with honey. Continue this for a week or two. The honey will be fully fermented in about a month, but is safe to eat at any time. To enjoy this fermented honey recipe, you can either eat the onions & thyme, take a spoonful of honey, or use the finished product as the basis of a marinade or dressing. Thanks to Colleen for permission to share this recipe with you. 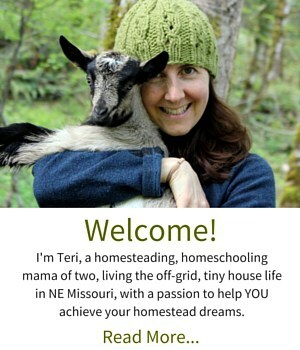 Her book, Healing Herbal Infusions has another yummy honey ferment, as well as dozens of other recipes for wellness. This fermented honey recipe makes a powerful immune-boosting remedy, but is equally delicious as a marinade or dressing! To use, simply take a spoonful of honey as an immune booster, or even enjoy a few onions. 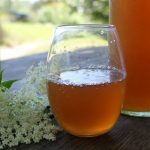 Elderflower Kombucha Recipe :: Wildcrafted, Fizzy, and Delicious! Has the shelf life changed with the fermenting of the honey? Honey by itself is a good anti oxidant. 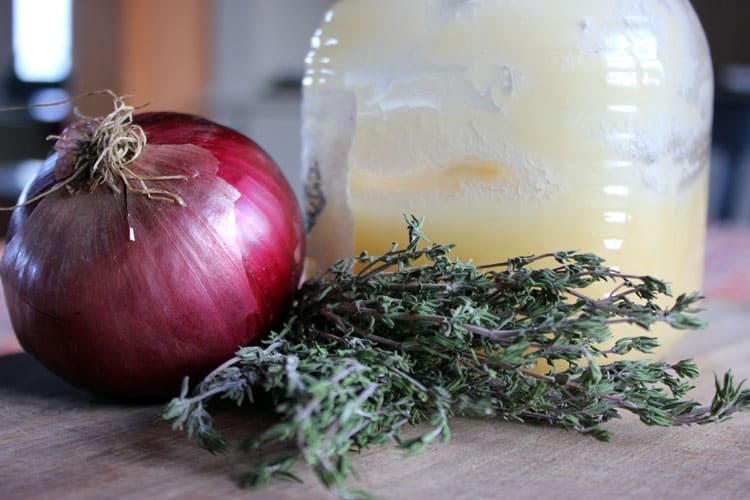 How does the addition of the onion and thyme improve the anti oxidant quality? Do the thyme and red onions by themselves have anti oxidant properties? 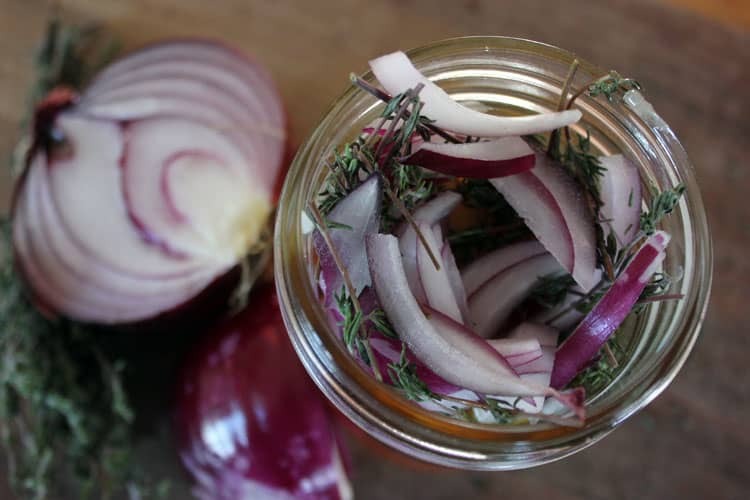 Yes, the red onion has anti-oxidant properties and the thyme is a great medicinal herb. It’s true, though, that any of these components on their own would still be fabulous for your well-being. But together, they really merge into a delicious remedy! How about using oregano rather than thyme? I still have fresh oregano but the thyme is past (far FAR northern California here). Yes, oregano would be a great substitution. Or sage!